As the last week of June has drawn to a close, thousands of people in the U.S. and the U.K. have taken to the streets, demanding guaranteed healthcare for all, as a human right. Just days later, on June 30, thousands of people in the U.K. marched through London, on the eve of the National Health Service (NHS)’s 70th anniversary. Marchers demanded the NHS remain “free, for all, forever,” in the face of attacks on the system by corporate interests seeking to profit off of what has been, and should remain, a public good. These marches took place on different countries with very different healthcare systems, but the footsteps of those taking part fell with unified purpose. While U.S. activists are moving forward, toward a health care system that belongs to the people, U.K. residents are saying there is no going backward to a time before the existence of just such a system, which provides care based on patient need and public health, not on ability to pay. The NHS certainly has a lot to celebrate, given that the countless lives healed and saved in its seven decades of existence prove that humane healthcare is possible — despite the fact that U.S. nurses and our allies are constantly told by corporate mouthpieces that such a system is unaffordable, too complicated, not achievable at this time. Nurses, more than anyone, are keenly aware that our own country’s failure to establish a humane healthcare system has deadly consequences. Every day, at the bedside, we bear witness to patients like Single Payer Strategy Conference speaker Rebecca Wood, whose lifelong pain from a debilitating jaw infection is the result of delaying her own care in order to cover her infant daughter’s healthcare bill. When our patients must choose between paying for rent or paying for lifesaving treatment, RNs bear witness to the fact that the end result of not having healthcare is human suffering and the loss of life. “27 days after Alec Smith lost his insurance, he DIED alone in his apartment. U.S. nurses will never give up on our fight for guaranteed healthcare for all as a human right. 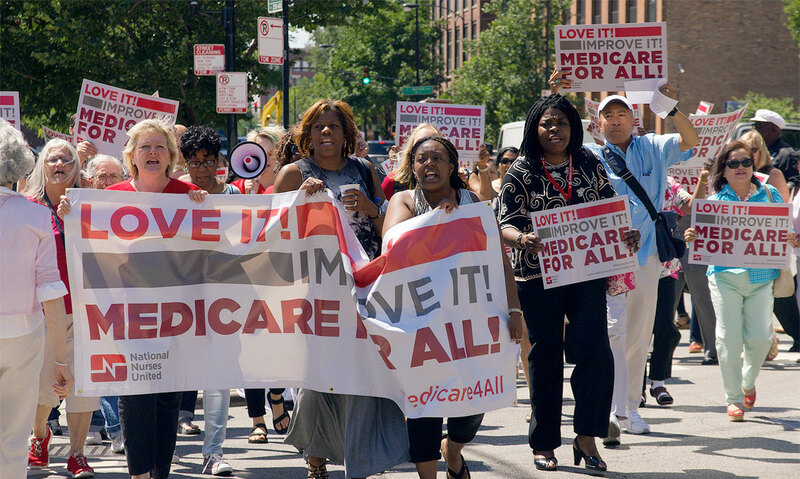 It’s increasingly what the people demand — with 63% of U.S. registered voters in a recent survey supporting Medicare for all. And on the eve of its 70th anniversary, we would like to thank the NHS for fueling our will to keep fighting forward, given the NHS’ proof that calling a shift to need-based care “impossible” is wrong. The NHS has shown us that it is possible to provide a high standard of healthcare without outrageous co-pays, premiums and deductibles, in a system that belongs to the people. U.S. nurses know the people of the U.K. must keep fighting to protect what they have, as continued attacks on the NHS seek to mask the same, old, tired issues we face here in the U.S. — underfunding by a government moving toward privatization. We stand in solidarity with you. On June 30, when a wide range of union and grassroots groups marched through London, with their “NHS: Free, for all, forever” message, National Nurses United was also there in spirit. Nurses are immensely proud of the devoted people who organized and fought for the NHS, and 70 years later, we are with them in their fight to save and protect it, just as we know they are with us until we achieve guaranteed healthcare for all. And we will achieve it; nurses never give up. 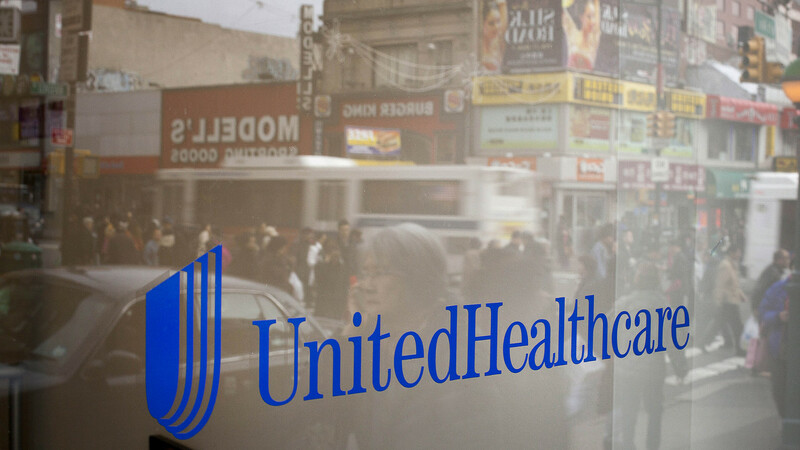 Working people cannot just depend on our elected officials to put public health over private profit. It’s up to all of us to use our collective voice, and our willingness to take to the streets, to demand what is moral and just. And together, on behalf of patients everywhere, we will win. — Bonnie Castillo is the Executive Director of National Nurses United, the largest union of registered nurses in the U.S.
Why the Healthcare Justice Movement is Just Getting Started in California and Beyond. 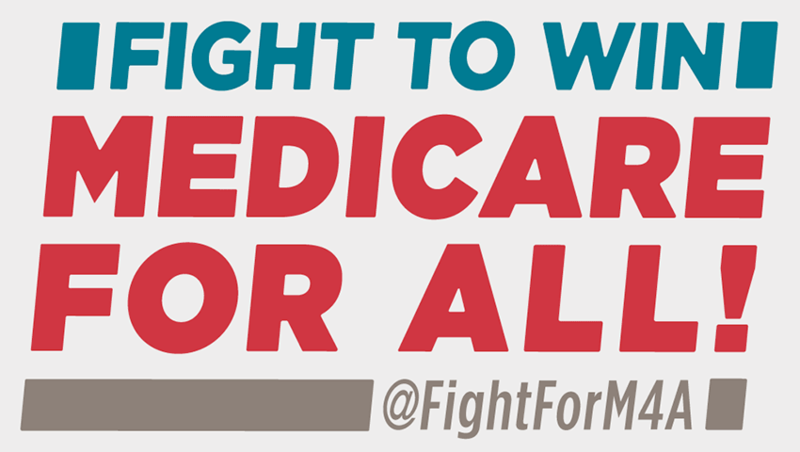 And we'll keep fighting until we win #MedicareForAll for our patients! Victory! Last night, the #Oakland City Council passed a resolution in support of H.R. 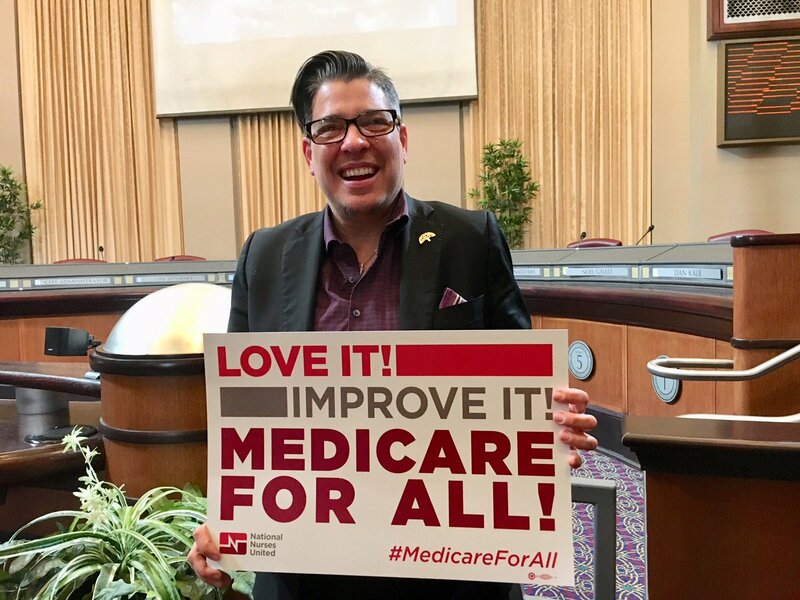 1384, the #MedicareForAll Act of 2019. Thanks to Council President @Kaplan4Oakland who sponsored the resolution and Councilmember @ShengForOakland who cosponsored. The people want #MedicareForAll - and investors are listening!! Members of Congress are at home in their districts during recess this week and next! Is yours hosting a town hall meeting? 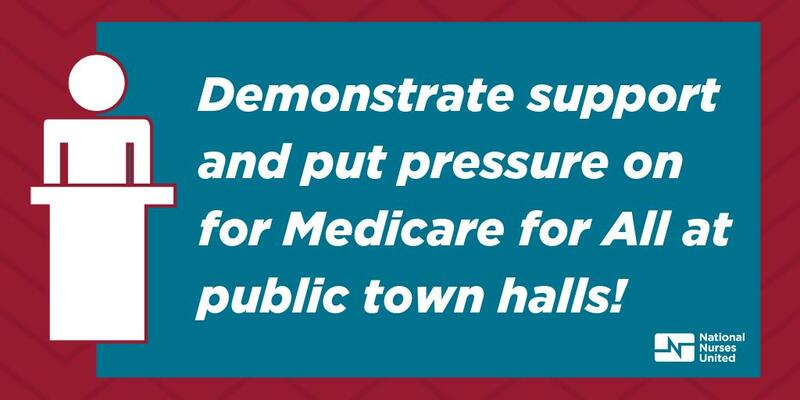 Use the opportunity to put pressure on for #MedicareForAll! 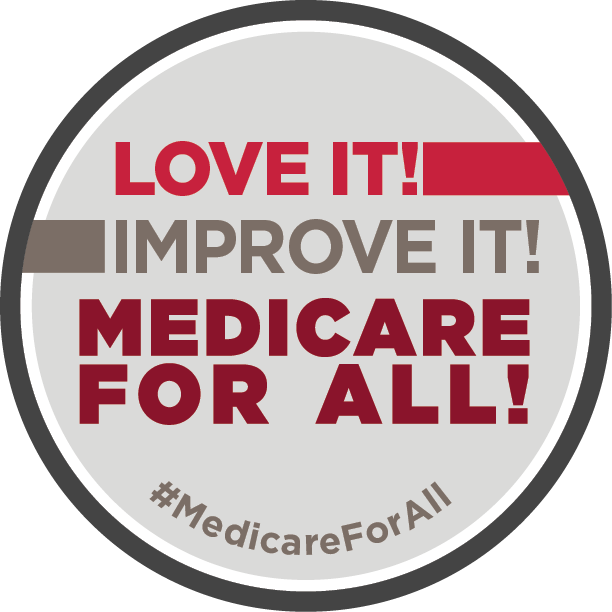 Attend a Medicare for All Action Near You!